In the majestic mountain and lake-filled region in the northeastern corner of California lies Redding and Shasta Cascade, one of Americas most spectacular, pristine and DOG-FRIENDLY regional destinations. Boasting 300+ days of beautiful weather a year, this area is rich in culture and heritage offering boundless outdoor recreation with magnificent landscapes and breathtaking vistas. From towering volcanoes, alpine ranges and glaciers to endless waterfalls, lush forests, pristine lakes and roaring rivers, this travel destination is one of a kind. Known as the trail capital of California with over 200 miles of hiking, (many dog-friendly), Redding is an outdoor adventurers dream. Not only are they known for endless trails, but with an abundance of nearby lakes, rivers, and streams, everything from kayaking and paddle boarding to boating and fishing is available here. On top of the trials and the rivers, Californias Shasta Cascade contains seven national forests, eight national and state parks, and several mountain ranges including the Trinity Alps, the northern Sierra Nevada, and the California Cascade range. Not to mention two massive glaciated volcanoes: the dormant 14,162 foot Mt. Shasta and the still-active 10,457 foot Lassen Peak. Among the first cities covered by DogTrekker.com, this breath-taking region is brimming with dog-friendly hotels, resorts, restaurants, shops, tours, historic sites, dog parks, cabins, and vacation rentals. There are plenty of areas for dogs and their owners to explore where rivers, mountains, wildlife and spectacular scenery collide. There are also dog-friendly events including the annual Ducky Derby, Art in the Park and the Bark, Wine and Brew celebration. On a recent visit, Bliss had a blast! 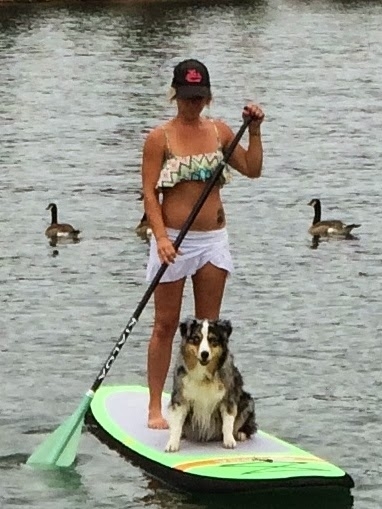 She went paddle boarding, kayaking, hiking and Whiskeytown National Recreation area where beautiful sapphire-blue waters are surrounded by mountain peaks. At the end of the day, Bliss fell right to sleep at TownPlace Suites, a dog-friendly hotel that is convenient to Turtle Bay Exploration Park and Redding Civic Auditorium, within close proximity of Sundial Bridge, Whiskeytown Lake. We stopped for lunch at Wilda's Grill, a dog friendly low-key restaurant and the home of the Buddha Bowl a favorite local dish, featuring gluten-free (highly addictive) concoction of brown rice, red beans, chicken or tofu, avocado, shredded cabbage, jalapenos, cilantro and two sauces (a sesame and soy-based dressing and a spicy garlic chili aouli). YUM! Check out this slideshow of Bliss in Redding.